Today, top global firms are increasingly making use of computer vision across domains — from autonomous driving and retail (Amazon Go) to healthcare (Amazon Deeplens and DermLens) — to improve operations and enhance productivity. The graph for development in computer vision in application areas has increased exponentially over the last few years. It is now being widely used by global tech giants like Amazon’s Rekognition, or Indian companies like FaceX. This technique does not predict as other artificial intelligence techniques do, it gives the outcomes depending upon the present content of images and it will be able to gain more accuracy with the passage of time. The data collecting process is way easier than the other techniques of AI. The worldwide library of images and videos are growing every day as millions of images and videos are being shared every day through Facebook, Snapchat, Instagram, etc. Autonomous Cars: The big tech companies like Microsoft, Intel, Apple, etc. along with the traditional car manufacturers like Hyundai, Honda, etc. are in a rat race to manufacture driverless cars. Computer Vision makes sense of the input as well as rely on cameras or other types of sensors to perceive the world. OpenVINO Toolkit: This toolkit by Intel enables CNN-based deep learning inference on the edge and supports heterogeneous execution across computer vision accelerators including CPU, GPU, FPGA and will be used to enable Vision-based intelligence at the edge across multiple architectures. Detection of Vehicle Damage: US-based CCC Information Services Inc. uses Computer Vision AI to automatically detect vehicle damage and visually depict that damage using unique heat maps. The damage detection technology and heat maps bring depth and insight into otherwise opaque damage photos that are fed into the computer vision and the algorithm detects the damages through the already fed training dataset. Vision Framework: This framework by Apple is used to perform various tasks on input images like face detection can be traced in the latest mobile operating system by Apple. The iOS 10 recognises different faces from photo library and sorts them into folders. 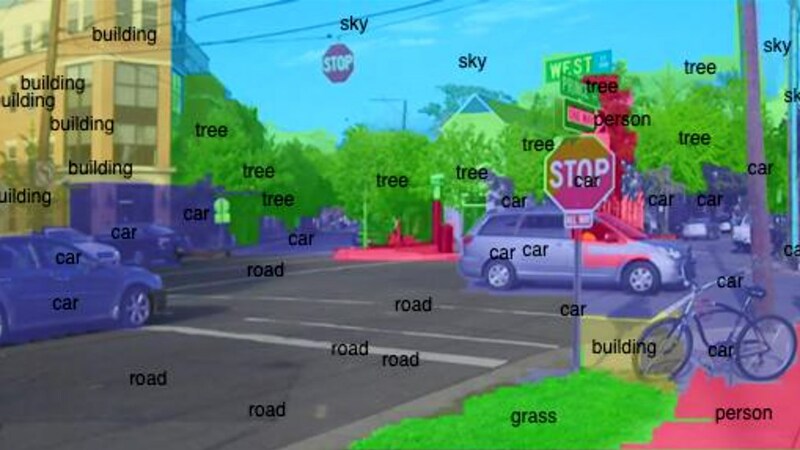 This framework applies computer vision algorithms to perform a variety of tasks to input images and video. Microsoft’s XiaoIce: This prominent chatbot from China use computer vision techniques to paint, draw and even comment to your shared images. Computer Vision makes it possible for this chatbot to look at images, point out objects and make inferences. Cashierless Grocery Stores: According to a report, The largest online retailer, Amazon is planning for opening 3,000 new AmazonGo cashier-less stores by 2021 that uses the technique of Computer Visioning. Computer Vision works as tracking your movements through the store after you’ve scanned your Amazon account at the front and also monitors when you take items off shelves. Lens: This tool is launched by photo-sharing app Pinterest as a beta product that works with the help of computer vision algorithms to recognise an object and provide contextual information to aid your in-store experience. It lets people use their camera phone to get recommendations inspired by objects they see in the real world. Project InnerEye: This project by Microsoft build innovative tools for the automatic, quantitative analysis of three-dimensional radiological images. The project develops computer vision and machine learning techniques for the automatic delineation of tumours as well as healthy anatomy in 3D radiological images. 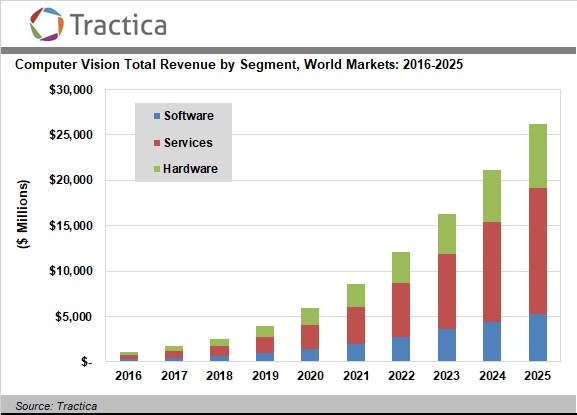 Tractica forecasts that global revenue from computer vision software, hardware, and services will grow from $1.1 billion in 2016 to $26.2 billion by 2025. The market intelligence firm expects that the growth in computer vision will be driven by a wide range of industries and an increasing diversity of applications. According to this analysis, there are top 10 cases for computer vision during the year 2016-2025 that will be forecasted. What Is The Difference Between Computer Vision And Image Processing?